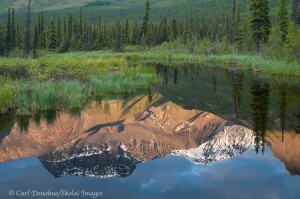 Boreal Forest and mountain reflection, Wrangell - St. Elias National Park and Preserve. Morning reflection, beaver pond, Wrangell St. Elias National Park and Preserve, Alaska. Please click on the thumbnail to view a larger version of the photo. Here’s a quick shot from my recent few weeks in Wrangell – St. Elias National Park and Preserve. I’m leaving in the morning for the Arctic National Wildlife Refuge, and will return in 2 weeks. I’ll try to post something from that trip then. Until that time, I hope you enjoy this scene. This photo was taken maybe an hour after dawn – around 4:30 am. 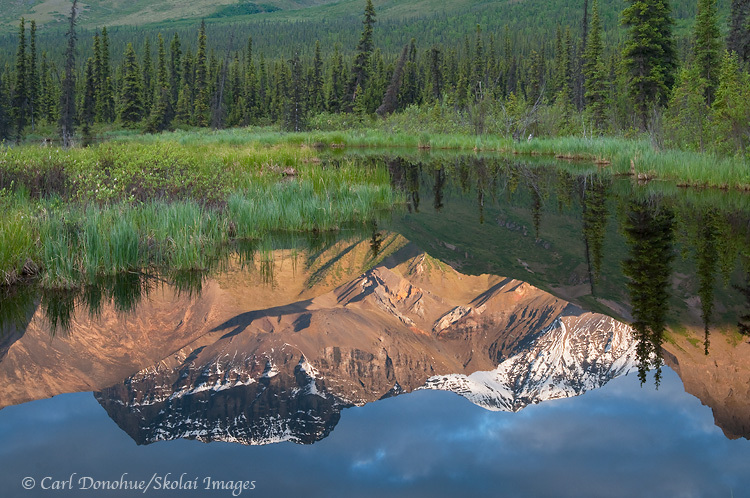 This entry was posted in Abstract Photos, Alaska, Forests, Landscapes, Wrangell - St. Elias National Park and tagged boreal forest, Landscapes, reflections, Wrangell - St. Elias National Park and Preserve, Wrangell St. Elias on June 26, 2010 by Carl D.
4:30 am, and it is an hour past dawn?! That would take some getting used to for this lower 48’er. 🙂 Sweet shot Carl. Incredible. This reflection is about as good as you can get. Great work Carl. I love this photograph. My father, landscape photographer Philip Hyde, made some upside-down, or partly upside-down reflection photographs off and on starting more than sixty years ago now. For most of his career, people sort of dismissed these images, but in later years they started to give them more appreciation. I am glad to see the upside-down reflection image is alive and well, and done so beautifully here. Beautiful scene. Looks like an incredibly still evening. The perfect reflection without seeing the mountains at the top forces me to look at it longer. Thanks everyone for the nice comments. I appreciate it.